When my friend Melinda asked me to take her bike-packing, and suggested Patagonia, one of my favorite parts of the world, l immediately said yes. And suggested the Carretera Austral. Which is the southernmost extension of Chilean highway 7. It is largely gravel, and dead-ends into a lake — meaning that the further south you ride, the less traveled it is. 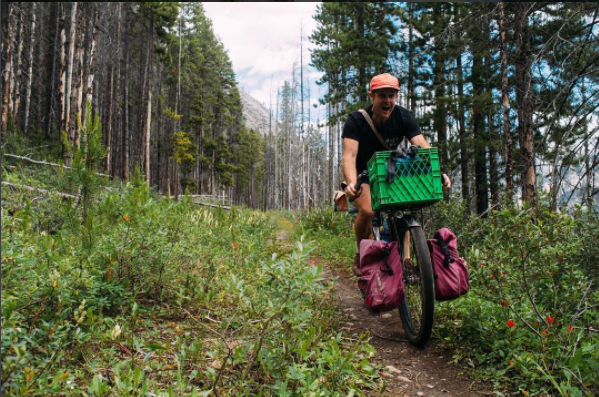 The road is well graded, the surroundings beyond spectacular, the water drinkable and the towns well spaced — pretty much a perfect route for bike touring. As such we had ridden while RidingTheSpine. So l felt confident recommending this stretch of road as an ideal place to try out bike travel. When other cyclists we met along the way discovered Melinda had never even ridden a loaded bike before, the were uniformly shocked (and awed). But the truth is, as spectacular and remote as it is, the Carretera Austral is a highway. Which means it’s nearly impossible to get lost, and busses and other such emergency/bail-out help are readily available. In addition to the aforementioned perks, the climbs are not particularly steep, and this time of year there is 14 hours of daylight — so no need to hurry or ride fast. Hard find a better spot to tour most anywhere in the world. I’m happy to say she loved it, and is now a confirmed bike-tourist. @crustbikes (matt) invited me to join him and @larkin80kv (darrin), @markreimer and possibly some other friends @ultraromance and @mr_shredward in Banff for a ~10 day ride on the great divide trail with the intention of making it to Missoula Montana for the 40th anniversary celebration of the Adventure Cycling Association. It seemed like the perfect real world test for sample ScapeGoat I had just built-up, not to mention lots of fun. Naturally l waited till the week before to commit — and flew to canada without the faintest idea what the ACA celebration would entail, nor any idea who else would be on the trip.